Swen Nater was a teenager who grew to be 6’11” and took up the sport of basketball in his junior year of high school. He was cut from his high school basketball team but a junior college coach found him and convinced him to try out. He made the junior college team and became more comfortable with his physical stature. His coach thought he could secure him a place with the legendary John Wooden at UCLA. The UCLA teams of those days were truly amazing, and the junior college coach knew that there was only one scholarship remaining. 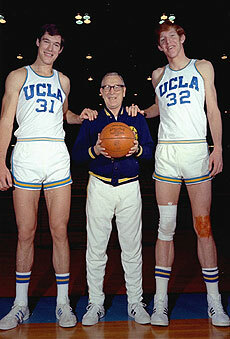 The challenge was that Swen was a center, and UCLA had the best center in the country in Bill Walton. Undaunted he called the legendary coach John Wooden and told him he had a player he would like him to consider for the last scholarship. When Coach Wooden asked about the player and found out he was a center, Coach Wooden asked why he thought it would be a good idea to use his last scholarship on a position that was already well covered. What he told Coach Wooden held the day and Swen became a UCLA Bruin. He told him that he understood that he had a great 7’0″ center and a great basketball team, but that his next tallest player was 6’9″”. Swen would give him the one thing he didn’t have … someone who could push Bill Walton in practice every day and make him better. Walton started every game and played almost every minute. Swen barely saw the floor. At the end of his career a reporter asked Bill Walton who the toughest center he had to face all year was, and Bill pointed at Swen and said “that guy is the best player I’ve played against”. While Bill Walton was drafted first by the NBA that year, Swen became the first player drafted in the NBA first round who never started a college game. He went on to play 8 years in the ABA and the NBA. He was the ABA Rookie of the Year and is the only player to lead both leagues in rebounding. I think this is true, and this is what happened for Swen. Bill Walton made him a better basketball player. But I think there is another side to this story. Swen also made Bill Walton better. He was the person who’s purpose in Bill Walton’s life was to make him a better basketball player. I think we all need one or more people who challenge us, work us out, make us hone our skills. So who’s your Swen? Who do you turn to every day to make you better? Who is it that has a real understanding of who you are, and more importantly has an inner drive to help you become more? Is it a sibling that knows you well and engages in friendly competition? Is it your spouse who channels their love for you along with their deep understanding of who you truly are to help you move to the next level? Or is it a peer at work with whom you have established great rapport, that you trust with your inner thoughts and value their vision, wisdom and advice as you work to be the “best you” you can be? We all need at least one Swen. No matter what level we play our game at, there is always a next level. Who do we have that knows our potential and thinks of it as their responsibility to helps us reach the fullness of that potential? In addition to having people who help us grow, I believe there is one specific Swen that I believe might be the most important of all … our “inner Swen“. Have we found that place inside of us that is non-judgemental, that doesn’t “should” on us, that we can go to and examine what we can do to reach the next level in our own development? Finding this “inner Swen” isn’t the easiest and it requires a great deal of self-awareness and self-respect to engage him/her in a positive manner, but when we do it can be very rewarding. My “inner Swen” writes this blog. He thinks of ideals in leadership and puts them in writing for others to see, and he challenges me to live up to them every day. Who could your “inner Swen” be? When I think of this concept as a part of essential leadership, there are two things that come to mind. Coach Wooden understood that being a coach and being a “Swen” are two different things, and likely mutually exclusive things. When we are in a direct leadership or coaching role we have different things to offer … guidance, teaching, goal setting, etc. Our team members do not want this relationship to seem competitive. They want feedback, they want kudos, and they want to be given new challenges and shown how to improve. Their Swen is someone that they can exercise their craft with, challenge themselves against a skilled person in the same discipline and work on improving their skills. I think that as leaders we need our own Swen. How do I find someone who understands not only my strengths, but also those areas where development may still be required? Most importantly, is that leadership peer willing to engage with me and help me maximize my strengths and mitigate my weaknesses? So let’s honour Swen Nater for what he did in his life. But let’s also honour him by seeking out our own Swen‘s and most importantly finding our “inner Swen” that is with us all the time with the singular mission of making us “a better me”! Looking back, I see where I didn’t seek out ‘Swen’s” or Waldon’s and short-changed myself. My belief it was ‘all up to me’ was extremely limiting — and it’s one I’ve been working on changing as I recognize more and more — it is not me against the universe and the universe isn’t ‘against me’ the universe wants me, no needs me, to succeed — and it’s always present in everything I do — which is why, ignoring the Swen’s is a choice I no longer want to make. Appreciate the insight — you are a Swen kind of guy! Hi Louise. You have been one of my Swen’s from the first moment we met! Thanks for opening new avenues of thought for me! And one of the things that you have helped me understand is that every moment matters! That is important in each interaction we have with someone, and is even more important when leading. There’s an ancient proverb that says iron sharpens iron. This may be the best illustration of that proverb I’ve heard. Because scarcity has been a theme for me, and specifically the avoidance of scarcity thinking, this story resonates so well. Swen in no way diminished the success of Walton, but rather created greater success and capacity for the team. I think the downfall of some leaders is that their ego gets in the way of knowing that they need a Swen. There is no shame in seeking help, or saying I don’t know. It’s what you learn and what you do next that is the true measure of leadership. Swen was awesome. Many would become discouraged by not seeing any playing time, but he held true until the end and it paid off for him. Great story Ian, I’ve been thinking about the people who have inspired me. I’ve been fortunate in my career to have two mentors. And a girl that worked for me for over 20 years, has told me several times, that I was her mentor. Even my good friends swen me, by keeping me humble, by keeping things in perspective, by reminding me what is important, by challenging me and my thinking. Thanks to people like you, my inner swen has been helping me strive for better health and personal growth. Thanks for the contribution Greg! I think mentor definitely is a form of a Swen. Other Swen’s compete, hold us to our standards, push us to be better and otherwise just cause to want to be better! Great post, which fits aptly with my own blog’s current theme on ‘needs’ and your reference to me of the Tony Robbins 6 need, one of which is connections (and encouragement from at least one of them). It is interesting how you have brought in the need of your own inner self. I find this extremely interesting and thought provoking. Great thoughts here Elizabeth. Connection is certainly a necessary thing in defining who our “Swen’s” are. Without it there isn’t the required trust and compatibility required to pull each other forward. When we choose a Swen (or a Swen chooses us sometimes) that relationship, while it may involve competition of some sort, is founded in a positive energy that is designed for us to become more and to move forward. That same concept is really important within ourselves, and hence the concept of “inner Swen”. Do we guide and challenge ourselves positively from within? Or do we allow doubts and fears to dominate? What an insightful and instructive message Ian. Thank you. The first thing I did after reading your post was identify my 5 “Swens” and then surface why they had contributed to my betterment and well being. My next step is to tell them and thank them for their unfailing support and love. I think we should start a “Swen” movement……….identify and thank those who have helped us become more of who we deserve to be in the world. Under separate cover I will send you John Walton’s leadership pyramid as my thank you back to you! Well done and congratulations! Love this. I love especially it started with a true story. Great post! I loved the underlying “true story” in this from the moment I heard Don Yaeger tell it. The underlying story of support and greatness between two young men is true in all of our lives if we look for it.